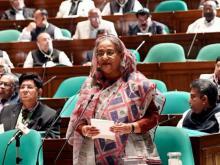 Prime Minister Sheikh Hasina on Monday expressed her firm optimism that the country was heading towards a meaningful election to continue the development spree in the coming years as she joined a dialogue with Jatiya Party-led United National Alliance (UNA). 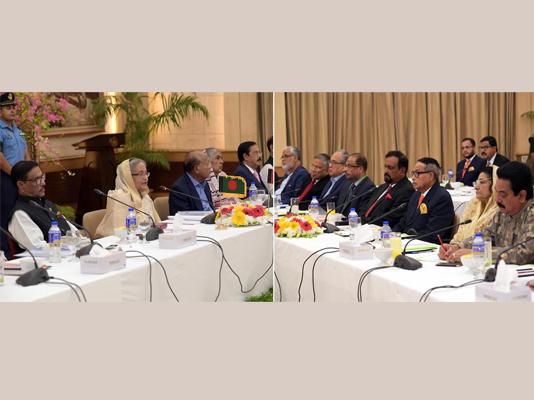 “Exercising franchise is a democratic right of the people and they will apply it in a free, fair and impartial manner in the next elections, “she said in her introductory comments at the dialogue of Awami League-led 14-party alliance with the UNA led by former president HM Ershad at Ganabhaban this evening. The dialogue between the two alliances kicked off at 7:15 pm at the Banquet Hall of Ganabhaban.